Aside from “Mike Hammer,” “Mary Hartman, Mary Hartman,” “Mash,” “Star Wars,” “Six Feet Under,” “Fernwood Tonight,” and “Howdy Doody,” there’ve been few TV series I cared a hoot about. “The Sopranos” is, in my opinion, one of the best-written shows ever on TV, and it breaks my heart that we won’t be listening to Tony talk to his shrink anymore after the season finale on June 10th. Now Deep Focus, HBO and Comcast have launched “The Ultimate Hits,” a surprisingly boring interactive scavenger hunt game based around The Sopranos. You race against the clock to find metaphoric clues relating to infamous hits from the series. Users also can enter the Ultimate Hits scavenger sweepstakes for a chance to win $5,000. 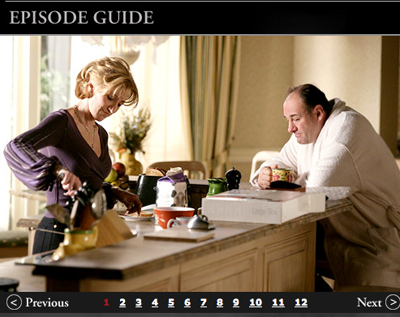 “The Sopranos” is, by far, the Number One TV series of all time. We’ve seen all the episodes on DVD five or six times. The writing is so rich that each time we watch an episode again, we pick up several terrific lines we missed during previous viewings. I wish I could find a decent Sopranos discussion board.